WARNING: o Never adjust the driver’s seat while the vehicle is moving. 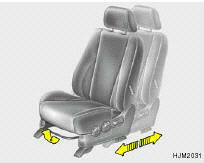 Any sudden or unexpected movement of the seat could cause you to lose control of the vehicle resulting in an accident. Only adjust the driver’s seat when the vehicle is stationary. o Do not sit or lean unnecessarily close to the airbag. 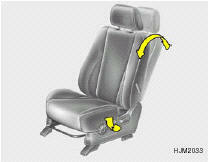 Position the seat so that you can sit as far back as possible from the airbag and still comfortably reach all controls. To move the seat toward the front or rear, pull the lock release lever upward. This will release the seat on its track so you can move it forward or rearward to the desired position. When you find the position you want, release the lever and slide the seat forward or rearward on its track until it locks into the desired position and cannot be moved further. WARNING: After adjusting the seat, always check that it is securely locked into place by attempting to move the seat forward or reverse without using the lock release lever. Sudden or unexpected movement of the driver's seat could cause you to lose control of the vehicle resulting in an accident. WARNING: Riding with a reclined seatback increases your chance of serious or fatal injuries in the event of a collision or sudden stop. The protection of your restraint system (seat belts and airbags) is greatly reduced by reclining your seat. Seat belts must be snug against your hips and chest to work properly. The more the seatback is reclined, the greater the chance that an occupant's hips will slide under the lap belt or the occupant's neck will strike the shoulder belt. Drivers and passengers should always sit well back in their seats, properly belted, and with the seatbacks upright. 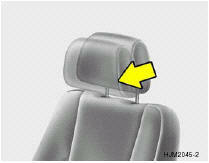 Headrests are designed to help reduce the risk of neck injuries. To raise the headrest, pull it up. To lower the headrest, push it down while pressing the lock knob. 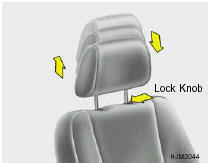 To remove the headrest, raise it as far as it can go then press the lock knob while pulling upward. This should only be done when the seat is not occupied. o For maximum effectiveness in case of an accident the headrest should be adjusted so the middle of the headrest is at the same height as the top of the occupant's eyes. For this reason, the use of a cushion that holds the body away from the seatback is not recommended. 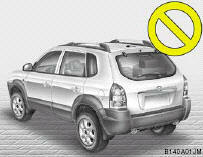 o Do not operate vehicle with the headrests removed as injury to the occupants may occur in the event of an accident. Headrests may provide protection against neck injuries when properly adjusted. o Do not adjust the headrest hejght while the vehicle is in motion. The active headrest is designed to move forward and upward during a rear impact. This helps to prevent the driver's and front passenger's head from moving backward and thus helps prevent neck injuries. 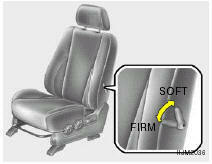 To raise or lower the front part of the seat cushion, turn the front knob forward or rearward. 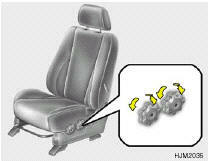 To raise or lower the rear part of the seat cushion, turn the rear knob forward or rearward. The driver's seat is equipped with adjustable lumbar support. To increase the amount of lumbar support, pull the lever forward. To decrease it, push the lever toward the rear. The seatback table is made by folding the front passenger seat forward. 1. Lower the headrest. 2. With the recliner control lever pulled up, fold the front passenger seatback forward to the flat position. 3. When returning the seatback to the upright position, ensure the seatback is completely locked into place. WARNING: o Do not sit on the seatback table. o Do not place items on the seatback table when the vehicle is in motion. o Do not leave items on the seatback table when the vehicle is in motion. The seat warmer is provided to warm the front seats during cold weather. With the ignition key in the "ON" position, push either of the switches to warm the driver's seat or the passenger's seat. During mild weather or under conditions where the operation of the seat warmer is not needed, keep the switches in the "OFF" position. NOTE: o The seat warmer will not operate if the ambient temperature is higher than 82.4°F ± 6.3°F (28°C ± 3.5°C). o If the seat warmer doesn't work when ambient temperature is lower than 75.2°F (24°C), it should be checked at an authorized dealer. WARNING: It is recommended that the seat heater not be used when elderly people or people who are ill occupy the seat. Also, do not use the seat warmer if the occupant is sleeping. 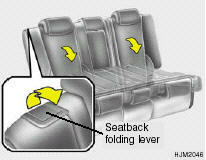 To recline the seatback, pull the seatback folding lever and release it after the desired seatback angle is achieved. When you recline the seatback to desired position, always be sure it has locked into position. CAUTION: When reclining the seatback, you should adjust the seatback folding lever while standing. For convenience, the seatbacks and seat cushions may be folded down and up. 1. Pull the seatback folding lever then push down the seatback. 2. Be sure it has locked into position to listen an audible "Click". 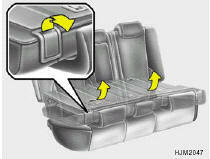 NOTE: o Before folding the seatback, place the rear seat belt buckles in the buckle pouch on the seatback. This will prevent the seat belt buckles from becoming covered by the seat cushion when it is returned to the seating position. CAUTION: Be careful not to overload seatback. Overloading may cause damage the seatback. 3. To return the seatback to its normal position, pull the seatback folding lever and reverse the above procedure. o When you return the seatback to its upright position, always be sure it is locked into position by pulling and pushing on the top of the seatback. WARNING: o The purpose of the fold-down rear seat back is to allow you to carry larger items than could otherwise be accommodated. Never allow passengers to sit on the cargo area while the car is moving. This is not a proper seating position and no seat belts are available for use when the seat back is folded down. This could result in serious injury or death in case of an accident or a sudden stop. Objects should not extend higher than the top of the front seatbacks. This could allow cargo to slide forward and cause injury or damage during sudden stops. o When you return the rear seatback to its upright position after being folded down, be careful not to damage the seatbelt webbing or buckle. In addition, do not allow the seatbelt webbing or buckle to get caught or pinched in the rear seat. WARNING: o When you return the rear seatback to its upright position, be sure it is locked into position. Attempt to move it. o Never attempt to fold or return seat while the vehicle is moving. For the safety of all passengers, luggage or other cargo should not be piled higher than the top of the seatback.